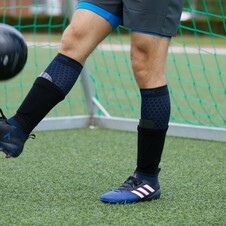 STOX Energy Blog - Do compression socks prevent sports injuries? Do compression socks prevent sports injuries? let's stat with a little technical story. Muscles are mostly grouped according to their function. You've got muscles for bending and stretching a limb. This group of muscles is surrounded by a thin tendonous casing. This is what we call a 'muscle bug'. The tendonous casing is pretty stiff and not very elastic. When the pressure in this muscle bug increases, the blood flow to the muscles gets locked. Because of this you can get injuries, little cracks or even a fracture. 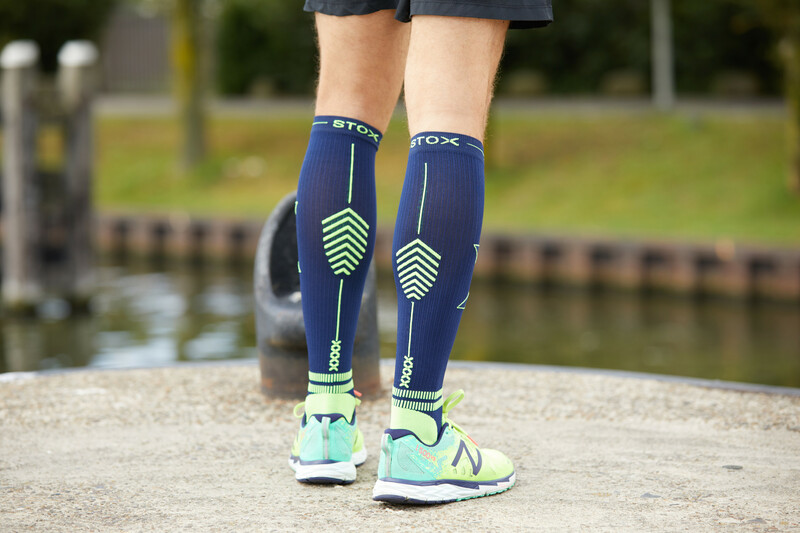 The compression socks from STOX Energy Socks stimulate the blood circulation in the legs and provide maximum oxygen-capacity of the muscles. This is due to the graduated compression that is integrated into all the socks. Basically it comes down to this: because of gravity, blood and fluid flow to the feet. The body needs all the help it can get to let it flow upwards again. The highest pressure (compression) is at the ankle and gradually decreases until it finally performs the least pressure just under the knee, causing blood to be "pushed" back up. In this way, an optimal blood circulation is achieved which prevents leg fatigue and muscle pain. Take a compression sock for instance, where pressure is also applied in the foot, like STOX. In this way the blood flow is stimulated throughout the leg. But this is not the only thing. 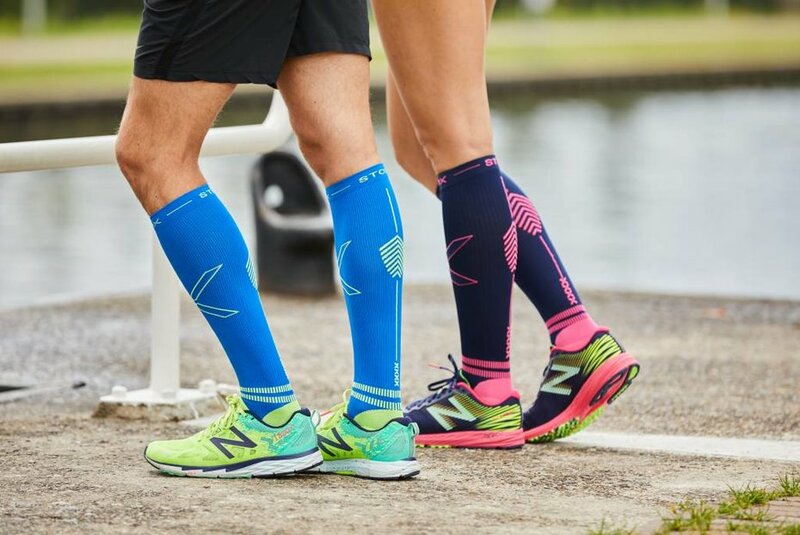 Compression socks keep the calf muscle more stable and this causes the calf to shake less sideways and, as it were, pulls the tibia, causing injuries like shin splints. Compression socks prevent these tibia irritation and can greatly reduce of even prevent shin splints. During exercising it doesn't matter if you wear tubes or socks, but it's very important to always wear compression socks after exercising for a good recovery. A tube can 'tie' the foot, causing you to suffer even more. That's why STOX has special STOX Recovery Socks. 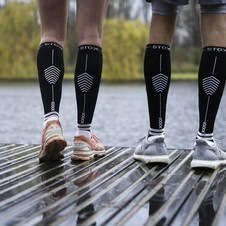 Wear STOX during and after your training and you will have less cramps or stiff legs the day after. 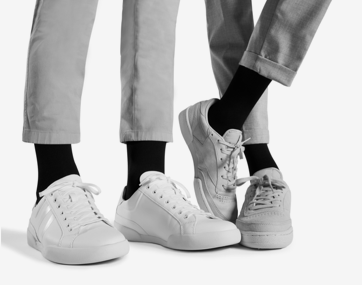 Read everything about the differences between tubes and socks here. Compression socks are a tool, not a miracle. This is important to know. It's still very important that you do a good warming-up and cooling down before and after your training. Or, for example, to tape in the place where you previously injured. And of course you need to make a good training schedule. It's impossible to directly start with marathon when you didn't even train. Now, it's true that compression socks promote the efficience of the warming-up and make your calves less tired during the effort. So, do compression socks prevent sports injuries? We can say: yes! As long as you adjust the of you training schedule and stretching exercises. > STOX Energy Blog	> Do compression socks prevent sports injuries?